Wharton Club Members & Guests Invited - Sign up NOW, as this will sell out quickly. SOLD OUT! On Tuesday, September 25, 2018, the Fourth Estate Restaurant at the National Press Club will host a dinner featuring Ashok Bajaj and the cuisine of Rasika, featured in the eponymous book, and paired wines. Rasika was named top DC restaurant in 2014 and to Trip Advisor's 25 best in America list two years ago. Rasika and Rasika West End are repeatedly cited among the top restaurants in the United States. This is a ticketed event. THIS SOLD OUT quickly, as noted when we still had tickets. Sorry if you missed out and would like to have joined us. On Tuesday, September 25, 2018, the Fourth Estate will host an Indian dinner with paired wines and discussion. Single tickets are $95; couple tickets are $180. A copy of the Rasika cookbook (one per individual person/couple) is included in the price. Using traditional techniques as jumping-off points, Rasika incorporates local, seasonal ingredients to reinterpret dishes from one of the world’s richest and most varied cuisines. Inventive recipes like squash samosas, avocado chaat with banana, eggplant and sweet potato lasagna, and masala chai crème brûlée accompany reimagined classics including chicken tikka masala, grilled mango shrimp, and goat biryani, rounding out Rasika’s menu of beloved dishes and new favorites. With a wide range of vegetarian options and spanning the spectrum from beverages and appetizers to entrees, rices, breads, chutneys, and desserts, Rasika represents the finest of what Indian cuisine has to offer today. Authoritative and elegant even as it incorporates a diversity of flavorful influences, this is the essential cookbook for anyone seeking to cook groundbreaking Indian food. 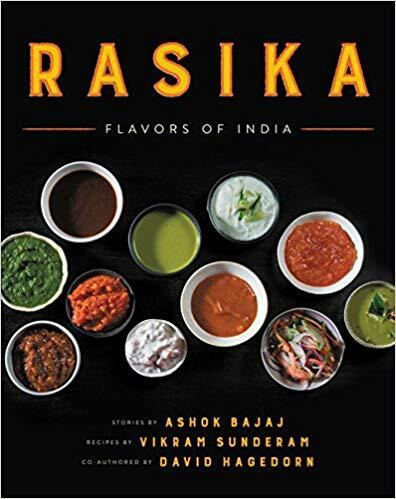 With over 120 recipes and stunning four-color photographs, Rasika showcases the cuisine of one of Washington, DC’s most popular and critically acclaimed restaurants, where visionary restaurateur Ashok Bajaj and James Beard Award—winning chef Vikram Sunderam transform Indian cooking into a fresh, modern dining experience.